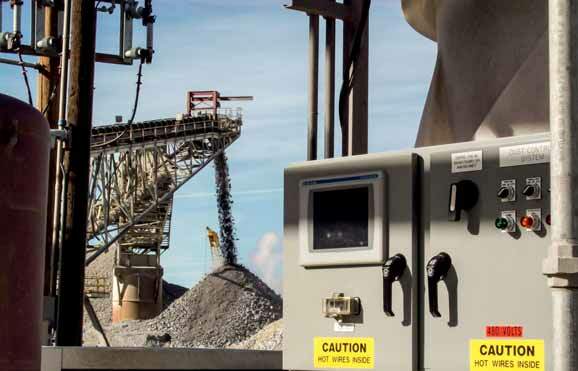 In a move designed to strengthen its strong position in dust control for bulk material handlers, Martin Engineering has announced the acquisition of TNJ Industries, an Arizona-based firm specializing in dust management for crushing and conveying of mined materials. The decision further broadens Martin Engineering’s extensive line of dust control products, allowing customers to benefit from an even wider range of components and experience to address fugitive material issues. Terms of the transaction were not disclosed. additives for specific applications has proven the company’s approach in some of the most difficult operating environments on the planet. TNJ Industries delivers highly effective dust prevention and/or dust suppression products and services, including turnkey spray systems, custom blended chemical formulations for wetting or binding agents, and other technologies demonstrated to be compatible with mining production processes. The company also supplies storage tanks, spray system controls and on-site customer training when needed. TNJ’s business model is built around the design and delivery of virtually hassle-free products and services, engineered for reliability even under the most difficult operating conditions. Founded in 1944, Martin Engineering makes bulk materials handling cleaner, safer and more productive. The company supplies flow aids and conveyor products around the world for a wide variety of bulk material applications, including coal, cement/clinker, rock/aggregate, biomass, grain, pharmaceuticals, food and other materials. The firm is headquartered in Neponset, IL, offering manufacturing, sales and service from factory-owned business units in Brazil, China, France, Germany, Indonesia, Mexico, South Africa,Turkey, India and the UK, and under exclusive licence with ESS Australia.